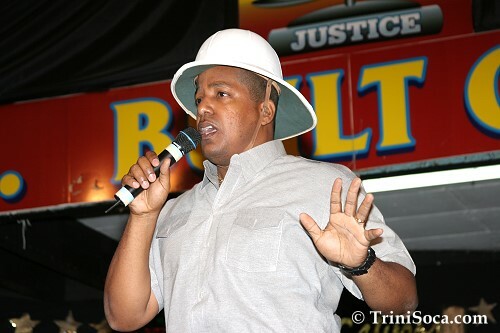 The 3rd Annual TUCO North Zone Calypso Monarch Competition was held at the SWWTU Hall on Friday 3rd November, 2006. The night began with entertainment by guest performer Knolly ‘Brown Boy’ Brown with his Calypso, “Exhibit in Court” and a comical performance by a member of the musical orchestra of the night, the Len Cummings and ‘D Wailers Kaiso Band. Mark ‘Contender’ John, the chairman of TUCO North Zone welcomed all to the SWWTU Hall and guaranteed a good show for all to enjoy. He also stated emphatically that the TUCO North Zone is synonymous with good standards and high quality and that the night’s proceedings would have been no exception. The Diamond Chorus Singers provided the back-up voices for the artistes who did a splendid job as per usual. The artistes of the night were judged based on two performances as they tried to dethrone the reigning Monarch, Karene Asche. The judging criteria are as follows: lyrics 30 points, melody 30 points, rendition 20 points, presentation 10 points and originality 10 points. The performances by the Calpsonians were quite entertaining ranging from comical pieces to social commentary. What also had the audience humored were some of the witty and comical statements by MC ‘Hotfoot’ along with his multiple change of outfits. Although Karene Asche’s performance was strong and appreciated by all, she was dethroned by Roger ‘Bodyguard’ Mohammed who’s performance won the approval of the judges. With a first prize of $30,000, it is certain that the award was coveted by all. Other prizes included: $15,000 for the second place winner, $10,000 for the third place winner, $5,000 for the fourth place winner and $3,000 for the fifth to twelfth place winners. Before the results were given, Austin ‘Superblue’ Lyons who was decked in white gave a toned-down performance at the beginning of his presentation with songs such as “Soca Baptist” and “Ethel” but turned up the pace at the end. He even provided a couple songs on the spot that were requested by the audience. Seeing that the prizes were quite generous and would hopefully be increased over the years, the fight for first place should be greater. We would have to see if Roger Mohammed would be able to keep the crown at next year’s competition.